« CyberPowerPC Gamer Master GMA2200A Desktop Gaming PC, Does It Perform Well? Fortnite Battle Royale on PC is a breath of fresh air for the battle royale genre. Epic Games developed something unique in this space and it’s very fun! When you see a game like PlayerUnknown’s Battlegrounds growing at the pace that it is then it’s pretty predictable that other companies are going to try and have their go at something similar. There’s just something about the battle royale/survival of the fittest idea that has caught the attention of millions of people. I feel like Fortnite is the first of many more games of this type to spawn in, it surely won’t be the last. With how unique it is, I could see it grow into something huge down the road. Fortnite started as a PvM (player vs monsters) type of game and that is where all of its base mechanics come from. It’s completely different compared to the PvP (player vs player) mode that they developed that can easily be compared to other similar games. This post isn’t going to be about Fortnite’s base game so I won’t be getting into that. 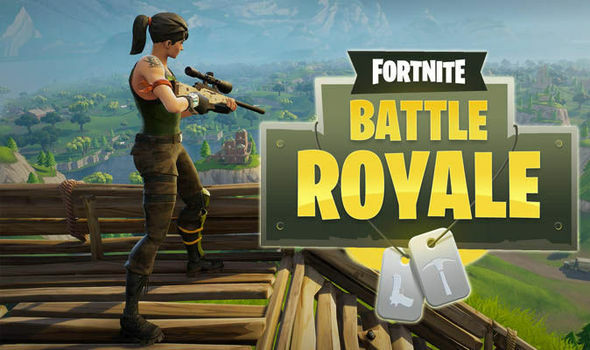 The community behind Fortnite have been asking for a PvP type mode for a while now and Epic Games decided to go with a battle royale type of mode for it. In a battle royale type of game there are a bunch of players in one area that only have one life. I’m talking 100 players. It’s a fight to the end. If you die, you really are dead and you’ll have to start up another match. You don’t get to respawn in a battle royale. The most popular game that plays like this right now is PlayerUnknown’s Battlegrounds (PUBG) which has the highest record for concurrent users right now. From the classic Battle Royale film to Hunger Games. Then to different mods for games like Arma and H1Z1… It’s a very popular type of game and it’s exciting to see what twists different companies are going to be able to come up with going forward. There is a lot of controversy going on with how Epic Games came out with this mode for their game and how similar it is to PUBG. Although I do believe that this mode wouldn’t exist had PUBG not had the popularity that it has, it’s still it’s own game entirely. I want to go over some of the key elements when it comes to the overall gameplay and compare them to PUBG. Fortnite has one camera mode that is locked in 3rd person. You can zoom in with scopes on some guns and you can increase your aim by holding down right click with hip fire. In PUBG you can toggle between 1st and 3rd person modes. In the normal servers the 3rd person camera allows you to peek corners without having to actually be around the corner. You can do this in Fortnite BR as well but it’s a bit different. The reason why it’s different is because it’s actually a balanced mechanic in Fortnite in comparison to PUBG. In Fortnite you can build some stairs instead of hoping there isn’t a person around the corner. In PUBG, you have to hope and pray there isn’t someone camping around the corner or try to peek it yourself. There is no base building in PUBG and this is one of the gameplay mechanics that really make Fortnite stand out as its own game. When the circle gets to be pretty small you’ll need to have a decent amount of resources to build a base. You gather resources by using your pickaxe on trees, rocks and structures. Then you can build walls, floors, stairs and roofs. You can even sometimes find traps around the map to keep people from getting inside of your base. In PUBG you take take cover behind trees or inside of a building and it is indestructible. In Fortnite, just about every object and structure has health so you can only take cover for so long. When you spawn in you start with nothing in both games. You have to pick a good spot on the map and try to find as much loot as you can such as armor, guns and meds. In PUBG you can loot a lot of different types of items. Depending on how much space you can carry you can have multiple grenades, boosts and healing items. For armor you need to find vests and helmets to increase how much damage you can take. In Fortnite you can only hold up to 5 items. This includes guns, meds and grenades. You can have as much ammo as you can find but you need to be wary of the types of weapons you have and loot the right weapons accordingly. There are multiple weapon types in both games that have their own stats. In PUBG it really comes down to personal preference on what you like and getting used to a type of gun or just adapting to the type of gun you found. In Fortnite there are different tiers of rarity with guns and so the more rare it is, the better it’s going to be. Guns have stats that have certain bullet spread, damage points and other visible stats. Arguably there are certain guns that are best in PUBG but there aren’t stats in-game to show you. 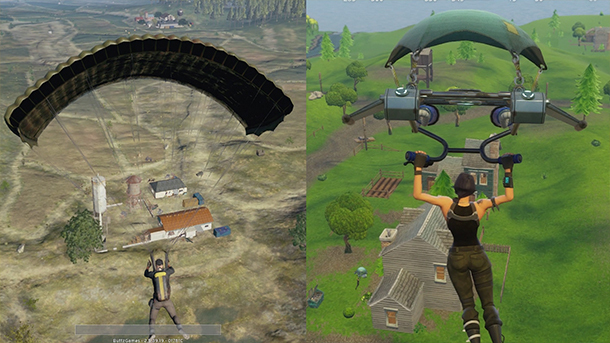 Both games have supply drops which drop the best loot in the game and if you’re quick enough, you’ll be able to have them but these are also popular for players to hunt others. If you’ve played PUBG before then you understand that it’s a very serious and you get a crazy adrenaline rush from it. Getting a kill feels very rewarding and you’re playing tactically to win. Fortnite is more laid back in comparison to this. There is a surge of adrenaline that goes on, especially at the end of a match, but matches are typically shorter and I find myself not purposely trying to win in every single match. I feel like you can sum up the differences between the two by saying that PUBG has a much more serious vibe whereas Fortnite is more laid back and casual. I enjoy both games a lot and I am looking forward to the future of both of them. I don’t think that they are so similar to where you can say that Fortnite Battle Royale is a blatant ripoff but I do believe it wouldn’t exist if PUBG didn’t exist. To really know what Fortnite Battle Royale is all about you’re going to have to try it out yourself! It has recently added in team modes as well as going 100% free to play on the battle royale mode. I think that it’s a complete blast and is its own game. The gameplay is too different to say that it’s a PUBG copy cat. You’ll need to play differently in this than you would in PUBG. So, have you tried out Fortnite Battle Royale? Do you think that it’s just a ripoff of PUBG? Or do you think it is its own game? Tagged battle royale, epic games, fortnite. Bookmark the permalink.